In more news of just how sick American racism is and, further, how it permeates every single aspect of American life, a St. Louis TV reporter got the boot after he posted a crass "lead diet" joke on Facebook around the shooting death of 18-year-old Michael Brown. According to reports, after it was announced that Brown’s mother, Lezley McSpadden, was invited to appear at the Democratic National Convention, reporter Bobby Hughes joked on a July 22 Facebook post that McSpadden would “talk about the new lead diet she’s endorsed. Five servings and you can lose 200 lbs in two years easily,” the St. Louis American reports. The statement drew immediate backlash: Black police officers in the area through the organization, the Ethical Society of Police, immediately called for Hughes’ dismissal, and Friday morning, the Fox affiliate’s black employees were planning an “emergency meeting” with the station’s general manager, according to the St. Louis American. By Friday afternoon, a KTVI spokeswoman confirmed that Hughes no longer worked for the station. Hughes later apologized to the black police society for his comments, as well as to the lawyer of Michael Brown’s family, the St. Louis Post-Dispatch reports. 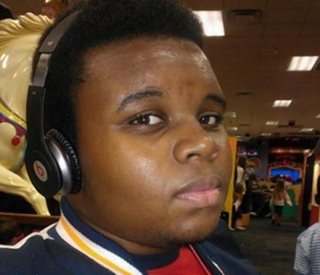 Michael Brown was fatally shot by white Officer Darren Wilson in Ferguson, Mo., in August 2014, sparking what is now termed the Black Lives Matter movement. Brown’s mother did, in fact, appear as part of “Mothers of the Movement” onstage at the Democratic Convention in Philadelphia on Tuesday night but did not speak. Read more at the St. Louis American and the St. Louis Post-Dispatch.